Captain Marvel is Coming For Us ! Filmizlehd.info – There is a big news for us that love to watch a super hero movie. Yes last night from their official canal you tube, Marvel Entertaiment just release their newest movie. Captain Marvel is coming to save the world ! Yes this movie is consider as the most waiting movie by super hero movie fans around the world, now they come with their trailer, lets take a look on how their trailer can satisfied their fans. As we know all super hero movie will having an action , adventure and also Sci-Fi genre on their movie same as other super hero movie. 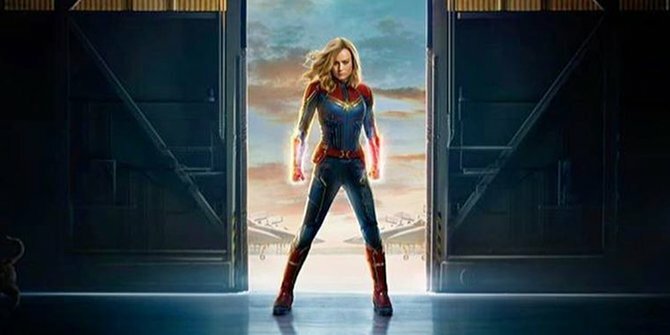 This film will be start with the show in where we will see a woman comes out from the darkness sky, crossing the earth atmosfer, burning, and fall in the roof of the building, Yes, The Captain marvel is coming ! From the rumors that we get, it has been told that Captain Marvel is an ex pilot that name Carol Danvers that having a super power after the accident happen to her when she is joining the mission with a space team name StarForce. In this trailer we can see the nostalgic moment in where the captain doing her old job as a pilot and also the moment when she was child back on 1990. In this movie also we can see how Captain Marvel using her super power fighting with her enemy. Also there will be an action in where Captain Marvel will punch the face of old woman that sitting on the train, why in the world that she do that ? who is she actually ? Our curiosity will come to the max when we are thinking on what the dangerous will be happen to Captain Marvel ? It should be from getting a peace in the world or from the outside space attack ? Movie fans need to be patient waiting for this answer because this movie is predict been release on march 2019.